Romelu Lukaku and Anthony Martial put CSKA Moscow to the sword as Manchester United took control of Champions League Group A with a ruthless 4-1 win on Wednesday. Lukaku scored twice at Moscow’s VEB Arena, taking his United tally to 10 goals in nine games, with Martial setting him up twice and netting a penalty before Henrikh Mkhitaryan completed victory. It was United’s first away win in the competition since November 2013 and with Basel thrashing Benfica in the other group game, it left Jose Mourinho’s side three points clear at the top of the pool. After grinding out a 1-0 win at Southampton on Saturday, United were back to their fluid best in the Russian capital, the pace and movement of new strike partners Lukaku and Martial causing CSKA headaches all night. Having beaten Benfica in their opening game, CSKA were brought back to earth with a bump, although substitute Konstantin Kuchaev gave their fans something to cheer with a 90th-minute consolation goal. While the hosts had their moments, the encounter rather made a mockery of United manager Mourinho’s eve-of-match claim that this was the strongest CSKA team he had ever encountered. Missing Paul Pogba, Marouane Fellaini and Michael Carrick through injury, Mourinho set United out in an unfamiliar 3-4-1-2 system, but the visitors took no time to find their mark. Paired in a new-look front two, Lukaku and Martial clicked instantly, combining to put United ahead in the fourth minute. Lukaku’s fine pass down the inside-left channel released Martial on the left and he checked inside before crossing to the back post, where Lukaku leapt to direct a strong header past Igor Akinfeev. After Akinfeev thwarted Mkhitaryan with his legs, Martial made it 2-0 from the penalty spot in the 18th minute following a foul on Mkhitaryan by Georgi Schennikov. Nine minutes later it was 3-0 as Vasili Berezutksi made a hash of clearing Martial’s low cross and Lukaku turned the ball home. 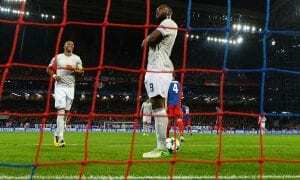 The frustration for CSKA coach Viktor Goncharenko was that his side manged to procure several sights of goal at the other end, only to find David de Gea an impermeable barrier. The United goalkeeper produced an excellent one-handed save to thwart Alan Dzagoev at 1-0 and tipped a powerful shot from Fedor Chalov over the ball at 2-0, as well as fielding attempts from Vitinho and Dzagoev. Akinfeev denied Lukaku his hat-trick early in the second half before more slipshod defending gifted United their fourth. Veteran centre-back Sergei Ignashevich gifted the ball straight to Ander Herrera, whose through ball released Martial. 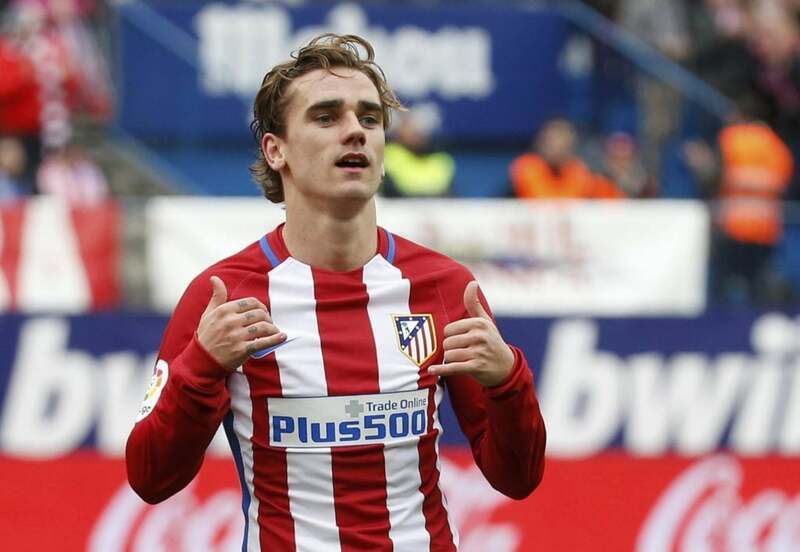 The Frenchman’s effort was parried by Akinfeev, but Mkhitaryan followed in to slot the rebound into the net. Akinfeev has now gone 45 games without a clean sheet in the competition proper, although his saves from substitutes Jesse Lingard and Matteo Darmian, allied to Kuchaev’s late effort, spared CSKA further embarrassment.